Indiana Gov. Mitch Daniels delivers the State of the State address to a joint session of the Legislature at the Statehouse Tuesday, Jan. 10, 2012, in Indianapolis. 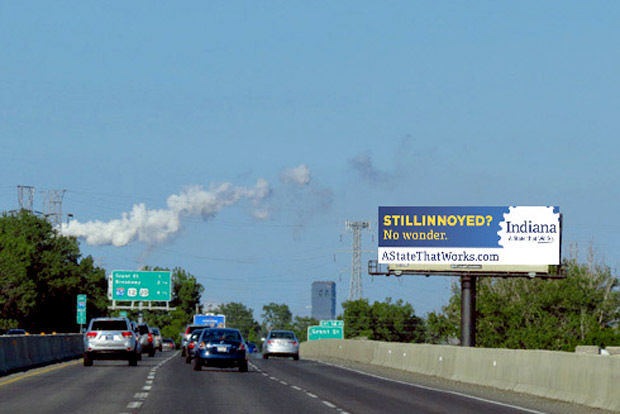 An example of a Stillinoyed campaign billboard designed to highlight Indiana's business opportunities. George Brown of Valparaiso, Indiana, works for a steel mill these days, but at one time, his main gig was construction — across the state border in Chicago. The commute and that “living in both worlds” familiarity didn’t prevent him from noting differences between the two states. Among them: The differing fortunes of state government. He had picked up details here and there about how Illinois owed money (the state comptroller recently said Illinois has more than $5 billion in unpaid bills), how the Prairie State was hounded by bills coming down the pike (it has approximately $100 billion in unfunded pension liabilities), and how it has the worst credit rating among U.S. states. On the other hand, just a few years ago, Indiana’s coffers were so flush that it returned money to state taxpayers. George’s question couldn’t come at a better time. Voters on the Illinois side of the border are deciding between candidates for governor, either of which is certain to confront some hard fiscal realities. The contest between the incumbent Democrat, Gov. Pat Quinn, and Republican Bruce Rauner is odd, though, in that there’s a phantom player in the mix, too: Mitch Daniels, Indiana’s former governor of Indiana. Rightly or wrongly, Daniels is credited with cutting Indiana’s budget and making the state’s finances the envy of Illinois as well as the rest of the nation. Quinn pushes back on some of Daniels’ key tenets, while Rauner says he wants to emulate what Daniels did. Regardless of where you fall on whether any state at all should follow “the Daniels playbook,” it is worth looking at what happened during his watch. After an eight-year term, Daniels left the governor’s office in 2013. He’s now president of Purdue University in West Lafayette. He rarely talks politics now, but after hearing George’s question, he was happy to revisit his tenure as governor, especially as it relates to Illinois’ financial mess. As Daniels tells it, things were bad for Indiana as he entered office nearly a decade ago. On his first day as governor in 2005, Daniels did something that is unimaginable in Illinois: He stripped bargaining rights for all state union employees. But Andrew Downs, director of the Mike Downs Center for Indiana Politics in Fort Wayne, says it’s uncertain how effective Daniel’s move was in shoring up the state’s bottom line. Daniels didn’t stop with state union employees. A few years later, he signed a bill to make Indiana the Midwest’s first right-to-work state. The policy changed workers’ relationship to private employers; new employees were no longer required to pay union dues at workplaces governed by union contracts. It effectively weakened unions’ standing in the state. Indiana’s GOP argues the move attracted business to the state and that, in turn, boosted state revenue. 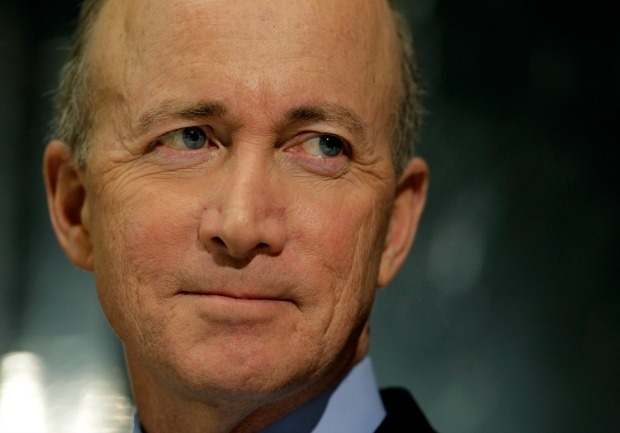 Daniels also pushed through a cap on local property taxes across the state. The cap limits the amount of taxes local communities can collect from a homeowner at one percent of a home’s assessed value. Proponents say that’s lead to robust home sales and — again, the argument goes — puts money back into the state’s coffers. If you hear Daniels and other supporters tell it, these policies created enough fiscal momentum that a few years ago the state sent $100 checks to each Indiana taxpayer. The state currently has a $2 billion stockpile, which it’s likely to hold onto this time around. If you’ve driven through the Chicago area, perhaps you’ve seen billboards along expressways that read “Illinnoyed by high taxes?” That advertising campaign (conducted by the Indiana Economic Development Corporation) lures city residents and businesses to cross from Illinois to Indiana. Michael Lucci says those ads — or at least the argument driving them — works on plenty of Illinois residents. Lucci is the Director of Jobs and Growth at the conservative Illinois Policy Institute. He estimates that Illinois has lost more than 100,000 residents to Indiana over the last decade. “It does hurt Illinois that we have such a business-friendly neighbor right next door because the people in Chicago can look east 30 miles and say ‘Look, there are jobs there, there are opportunities there and I can move there and still be close to my family,’” Lucci said. But not everyone sees Daniels’ bumper crop budget as an achievement. Illinois Gov. Pat Quinn isn’t willing to stomach Daniels’ sacrifice of collective bargaining rights. Earlier this year, the incumbent governor told a union-heavy crowd that he believes in collective bargaining. “I think that’s the best way to go and I look forward to working with you on it,” Quinn said during an April debate in Chicago. The governor has argued that strong unions improve state residents’ income and quality of life. Some in Indiana see a darker side to the budget surplus too. Hammond Mayor Tom McDermott Jr. is among them. McDermott’s point is this: What’s the use of a surplus if some basic services aren’t being met? “We could expand the affordable healthcare act [ACA] in Indiana right now and insure hundreds of thousands of additional Hoosiers but they just refuse to do so even though there is 2 billion dollars in the bank, those hundreds of thousands of Hoosiers don’t deserve health care like people in Illinois do,” he said. Does Illinois have a chance of turning things around? Of all people, Daniels is among those who say “yes.” Of course, it’s no surprise that he recommends Illinois gubernatorial candidates Quinn or Rauner wrangle with public sector unions, pay more bills on time and slash spending. But the architect of Indiana’s brand of fiscal conservatism also says Illinois can draw from its own good ideas. And he ought to know: He stole a few of them. After Chicago leased its public Skyway to a private operation, Daniels did the same thing for the Indiana Toll Road. And then there was the program to let delinquent taxpayers pay with no penalty. Michael Puente is WBEZ&apos;s Northwest Indiana Bureau Reporter. Follow him @MikePuenteNews.